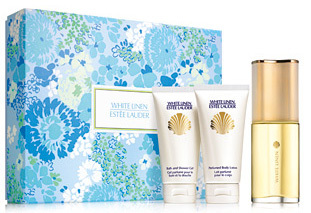 5 of my Favorite Mother's Day Gift Sets from Estée Lauder. There is just about a week until Mother' Day. Estée Lauder has a great selection of gift sets for mom, available online or at your nearest Estée Lauder counter. Here are my 5 favorites! Keep it Classic. The White Linen Fresh Classics fragrance gift set guarantees a happy mother. The soft, crisp, citrus scent is the perfect mix of casual luxury that is perfect for everyday. This modern classic collection includes a 3oz Parfum Spray, 2.5oz Body Lotion and 2.5oz Bath and Shower Gel. A Perfect Gift for a Perfect Parent. 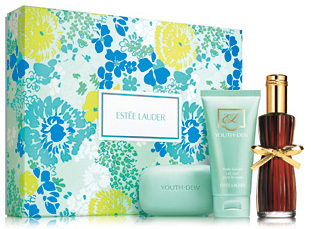 Captivate her with the Estée Lauder Youth Dew Always Perfect fragrance gift set. This trio of opulent flowers, rich spices and heavy woods include a 2.25oz Eau de Parfum Spray, 2.5 oz Body Satinée and a 3.5oz Perfumed Soap. It’s Mom’s turn to feel Sensuous. The Estée Lauder Sensuous Mother’s Day fragrance gift set features the woodsy, intimate scent in three elegant luxuries including a 3.4oz Eau de Parfum Spray, 2.5oz Satin Body Lotion and 2.5oz Silken Shower Creme. Tell her she’s Beautiful inside and out. Show her you care this Mother’s Day with the gift of a thousand flowers. The Beautiful Romantic Favorites fragrance gift set is wrapped in an exclusive, contemporary floral print box and includes a 2.5oz Eau de Parfum Spray, 2.5oz Perfumed Body Lotion and 2.5oz Bath and Shower Gelée. The Simple pleasures in Life. Celebrate her day with the best of life’s little pleasures. The Estée Lauder pleasures Best of All fragrance gift set is wrapped in an exclusive, Mother’s Day themed box. The sheer, spirited fragrance comes in a trio of products that include a 3.4oz Eau de Parfum Spray, 2.5 oz Body Lotion and a 2.5oz Bath and Shower Gel.